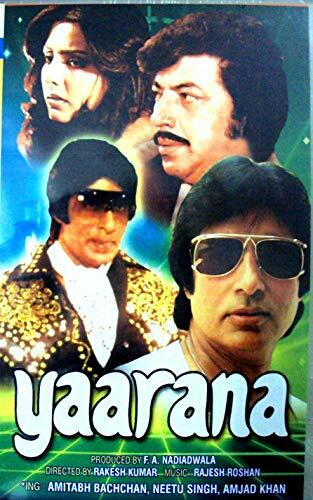 Description: Multi-millionaire Bishan Kumar and orphan Kishan are inseparable friends and live in the same house with Bishan's widowed mother and a maid servant. Bishan's father was responsible for the sentence of his uncle who has a criminal background; after completing his sentence Bishan's uncle pleads with his mother who forgives and accepts him and his son, Jagdish to live in the house together with them. While Kishan is a hardworking farmer who cultivates a plot of land Bishan goes abroad to further his education. Years later Bishan return as an adult only to renew his friendship with Kishan who is also an adult; Bishan then finds that Kishan has a golden voice which cannot be recognize in the village but can be heart rendering in the world of music in the city. Meanwhile Kishan is introduced to Bishan's wife, Sheela and son, Munna. Bishan decides to make all arrangements to take Kishan to the city; at first he refuses but later on agrees when Bishan convinces him. In the city Kishan gets to perform in his first singing concert which turns out to be a success rendering Kishan as an over-night star; his life changes when he gets to learn that Bishan's uncle and his son, Jagdish has embezzled all the family's assets and money, his wife and son is no longer with him and he had borrowed huge sums of money to fund him as a star. Kishan then decides he will use his musical talents to fund back his friend thus stabling him back to square one but unfortunately Bishan is hold as a hostage by his uncle and Jagdish on a yacht he once owned and is forced into confessing that he had a hand in abducting numerous school children. When Kishan gets word about this it stresses him into being a mentally unfit patient who is admitted to a mental asylum.Multi-millionaire Bishan Kumar and orphan Kishan are inseparable friends and live in the same house with Bishan's widowed mother and a maid servant. Bishan's father was responsible for the sentence of his uncle who has a criminal background; after completing his sentence Bishan's uncle pleads with his mother who forgives and accepts him and his son, Jagdish to live in the house together with them. While Kishan is a hardworking farmer who cultivates a plot of land Bishan goes abroad to further his education. Years later Bishan return as an adult only to renew his friendship with Kishan who is also an adult; Bishan then finds that Kishan has a golden voice which cannot be recognize in the village but can be heart rendering in the world of music in the city. Meanwhile Kishan is introduced to Bishan's wife, Sheela and son, Munna. Bishan decides to make all arrangements to take Kishan to the city; at first he refuses but later on agrees when Bishan convinces him. In the city Kishan gets to perform in his first singing concert which turns out to be a success rendering Kishan as an over-night star; his life changes when he gets to learn that Bishan's uncle and his son, Jagdish has embezzled all the family's assets and money, his wife and son is no longer with him and he had borrowed huge sums of money to fund him as a star. Kishan then decides he will use his musical talents to fund back his friend thus stabling him back to square one but unfortunately Bishan is hold as a hostage by his uncle and Jagdish on a yacht he once owned and is forced into confessing that he had a hand in abducting numerous school children. When Kishan gets word about this it stresses him into being a mentally unfit patient who is admitted to a mental asylum.